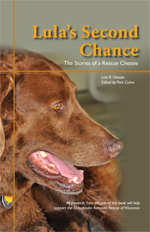 The Chesapeake Retriever Rescue of WI is a group of volunteers dedicated to rescuing Chesapeake Bay Retrievers and finding them loving forever homes. We rescue adoptable purebred or mixed Chesapeake Bay Retrievers from shelters, strays, and from owners who can no longer care for their dogs. We are staunch promoters of spaying and neutering, and no dog is placed by our organization without this being done before placement. We also educate potential adopters about the breed to make sure a Chesapeake is the right dog for their family. All of our dogs are in foster homes, where they are evaluated for temperament and training needs, and are given proper medical attention. We usually keep a dog for at least 2-3 weeks to give us the best knowledge of their needs. Our dogs come to us through shelters or from owner surrenders. Owners wanting to surrender their dog will be asked to have them spayed or neutered and brought up to date on their vaccinations. Owners must also sign a form giving us all rights to the dog at time of surrender, as well as a release to obtain all of the dog’s medical files. Lula’s books are being shipped USPS with 3-5 business days of the order being received. We will get it to you ASAP. All proceeds go to the CRROW Medical Fund. Share the story of this very unique special needs, senior rescue dog. While Lula is very unique, her plight is not. There are thousands of senior and/or special needs dogs around the country looking for a loving home to live their final days surrounded by love and companionship. Get to know Lula and you will fall in love with the life and love an older special needs dog can bring to your life – not all of them have her “adventuresome” spirit!